Today’s boxing fan wants faster and more brutal bouts, and TV series like The Contender are delivering. 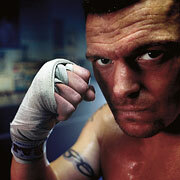 Meet John Wayne Parr, the Aussie in the middle of the successful concept’s Asian affair. John Wayne Parr – “The Gunslinger”, five-time Muay Thai world titlist, one of the finest stand-up fighters in the world – looks every inch the brawler. His hair’s cropped to a marine-style buzz cut. Both eyebrows are wealed with scars. He’s liberally smattered with tattoos, many in Thai script. He’s lean-limbed and furrowed with ribs and abs and various other muscles I wasn’t aware existed. His hands are square and hard – two sharp packs of lead. He looks, in short, like a weapon. Until he opens his mouth. Then he’s pure boyish charm – chatty, eager, a little nervous; leaning close, talking fast, cracking jokes and always, always giggling. It’s so incongruous it’s disconcerting.